Dogs have been called mans best friend, occasionally, humans prove that the friendship extends both ways. 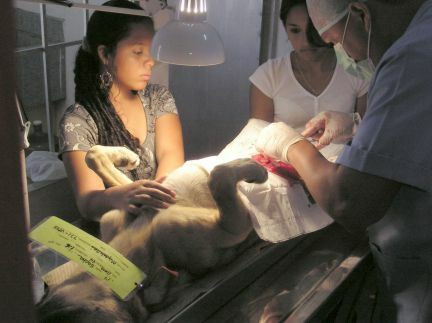 Spay Panama, is a non-profit organization that was set up in 2001, so that affordable spay/neuter facilities would be available throughout Panama for persons of low-income and also for people who feed and care for homeless animals. Yesterday, I witnessed the group in action in the mountain town of Volcan. 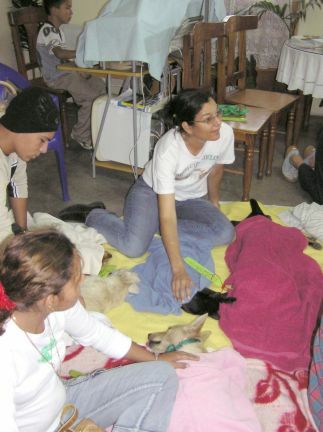 Francia Pinedo, a local realtor, donated the use of her office for a day so that sixty cats and dogs could be treated. When I entered the office of Volcan Real Estate the scene was reminiscent of a post-disaster triage. To my left several volunteers were trimming the fur and disinfecting cats and dogs prior to sedation. To my right, on a blanket covered floor, 8 or 10 pet owners were lovingly massaging their animals as they recovered from the procedure. The air was thick with the smell of disinfectant. The organizer of this temporary clinic is a 66 year-old ex-pat by the name of Dottie Atwater. She exudes high energy and a commanding presence in the room, something that seems to agree with her, as I would have guessed her age at being ten years younger that it was. I called her away from her duties to try and carry out an interview, but this was interrupted as a small black dog suddenly vomited at our feet. Dottie rushed off and returned with some paper towels and started cleaning up. She asked the owner if the animal had been fed that morning. The young girl, somewhat apologetically, admitted she had. Dottie, placed a motherly arm around the girl and reassured her that despite the incident, the animal would be fine. “Why do you do this,” I asked Dottie? She said that it broke her heart to see starving and diseased animals on the street. She went onto explain that besides the humanitarian side of taking care of homeless cats and dogs, there is a very real public health issue. Many of the cats and dogs she explained, have venereal disease. This is transmitted between the animals and of course can be a problem as children and animals often share the same play-space. I was amazed at the efficiency of the operation. Each animal is first weighed, tagged and examined. After the procedure, they are given a pain-killer, an anti-inflammatory, treated for ticks and fleas, and finally they receive a B12 vitamin shot. Although the vets are paid for their work, everyone else involved, does it purely voluntarily. There is a wonderful atmosphere of sharing amongst the volunteers, Ruby McKenzie, from the sister town of Boquete brought over a large sized weighing scale, and in return the Volcan people will provide their autoclave for use at the Boquete clinic. 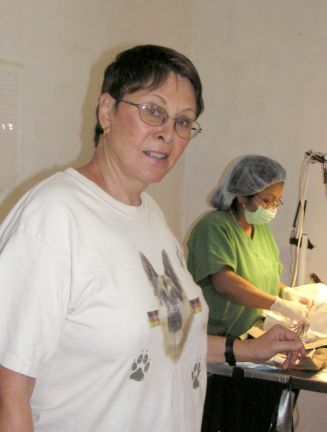 The anethetist, Dr. Chely also hails from Boquete, Dottie tells me that normally Dr. Chely is paid a nominal fee, however on this last occasion the good doctor refused to accept any money. “Taxi,” someone yelled from a back room. This was the signal that another dog had been successfully treated and needed to be moved from the operating table to the comfort and care of its owner. Immediately, two local ex-pats, Gene Robinson, a former Homeland Security officer and Wally Ewen, a retiree, rushed into the operating area and lifted the sedated animal off the stainless steel table and carried it over to the recovery area. With almost clock-work precision the next four-legged patient was placed onto the vacant operating table. The three vets, Doctors Andreas Tello, René Guarjardo and his wife Letty work tirelessly on a production line basis. It should be noted that these doctors use the preferred method of small-incision surgery. The openings are normally about 2 inches long – other methods employ longer, 6 to 8 inch openings, but these come with the greater risk of infection and post-operative opening. Strange as it may seem, the wonderful work that these people carry out has drawn some criticism. Some vets claim that this is taking work away from them. 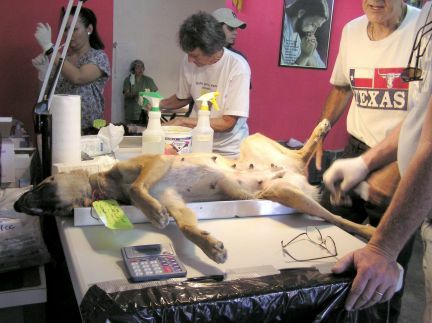 This argument is countered by the fact that in this clinic, the three Panamanian vets are being paid for their work. They receive $20 per dog and $10 per cat. People who bring their animals are asked for a contributory donation, but if they cannot afford it – the operations are carried out for free. 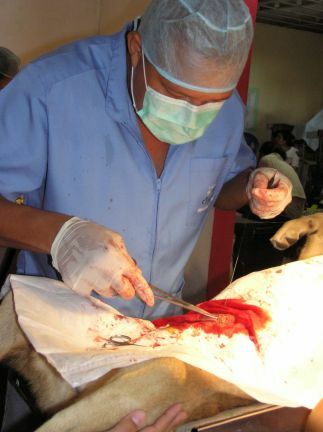 In truth, if these clinics did not exist then it is doubtful if the average person could afford to have the procedure done – the result would be that tens of thousands of animals would be destined to end their lives dying slowly and horribly from starvation and disease. Outside the real estate office I met “Bob” a bushy haired dog who was slowly recovering from the sedation. His wobbly legs and bleary eyes told me that he wouldn’t be driving or operating heavy machinery for a while. The other day, as I drove through Volcan, my Panamanian friend remarked that she saw a substantial decrease in the number of diseased and homeless animals. Hopefully, in the future, every animal in Panama will live in a home where they are loved, cared for and where they are never abused.